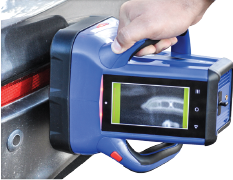 Find concealed threats in motor vehicles, back-packs and other locations. There is nothing in the marketplace, at any price, that’s this advanced, and capable across such a wide range of critical missions. Generations ahead of the competition. Rugged MIL-STD 810G Drop tested & IP65 Rated Splash Proof. *Note: The Pb200i is not warrantied against breakage from impact. The Pb200i has completely changed how we conduct lead surveys and bid work. Our previous analyzers...were heavy, slow, and expensive to resource...Viken Detection [XRF] analyzers allow us to spend half the time in the field...we are impressed by the customer service we receive...They genuinely care about my company. We make the most technologically-advanced handheld x-ray instruments in the world. Viken Detection’s revolutionary HBI-120 Backscatter X-Ray Imager enables law enforcement and security professionals to perform narcotics interdiction and threat detection missions better, faster and more cost effectively — to find contraband such as cocaine, heroin, methamphetamine oxycodone; currency; and explosives hidden in motor vehicle, airplanes and boat concealments (“traps”); walls, ceilings, floors and furniture; in luggage and electronics and more. Viken Detection’s Pb200i is the world’s smallest, lightest, most rugged x-ray fluorescence (XRF) instrument and the new standard for lead paint testing — fast, accurate, easy to use, loaded with features and inexpensive to operate. All Viken Detection products are made in the U.S.A.